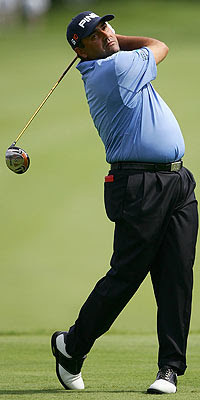 Maybe Angel Cabrera is going to show us why he won the US Open. After Saturday's play at the Singapore Open, he is leading the field by four strokes. The USA's Jim Park is in second place. Phil Mickelson had a rough day with four bogeys and now finds himself 11 strokes off the lead. However, one bright spot, on the par 3, 17th hole, he nearly had a hole-in-one with the ball bouncing off of the pole and landing three feet from the cup. Ernie Els missed the cut. 0 Response to "Cabrera Takes Lead at Singapore Open"